I want to share a strategy that I have implemented in my classes this year and has been very helpful in establishing relevance to topics taught and in making connections between topics taught within a unit. This strategy also provides a way for students to ask questions and make written explanations of phenomena, which are “Science and Engineering Practices” of NGSS. I first learned about the strategy from a fellow science teacher in my department, who loaned me a copy of the book, Teaching Science with Interactive Notebooks, by Kellie Marcarelli. I don’t use interactive notebooks in my classes the way they are described in the book, but I do think The Aha! Connections and Aha! Thesis strategy described in this book is gold.1 I have implemented my own version of this strategy in my classes for about 6 months now and it has gone really well so I want to share how I’ve used it in my classes. Step 1: I break each unit down into 3-6 learning targets. Before beginning a unit, I choose a phenomenon that touches on as many aspects of the learning targets that make up the unit as possible. It will be challenging to find phenomena that apply directly to every learning target of every unit and it is okay if a phenomenon doesn’t hit all learning targets of a unit. The trick is to pick a phenomenon that touches on as many of the unit’s learning targets as possible. Step 2: Students observe the phenomenon at the very beginning of the unit prior to any instruction. I ask them to write down as many observations as they can about it and to also to write down at least 2 questions they have about what they see. Figure 1: Example of student "Big Question - Connections Page"
Step 3: After students have a moment to write down observations and questions, I ask them to share the questions they wrote. As they share their questions, I type them in to a Google Doc on the projector for all to see. Together we then select the question or questions we think are best to serve as our “Big Question” for the unit. I attempt to guide this selection process toward a question that most fully captures the core ideas for the unit and one that I think will lead to the best "Aha! Thesis" at the end of the unit. At the same time, I try to modify the student questions as little as possible. Students write the “Big Question” inside the light bulb on their “Aha! Connections Page" (see Figure 1). Step 4: (Ongoing throughout the unit) After we have covered each learning target, I instruct students to go back to their "Aha! Connections" page and write a short summary about how information learned in the learning target helps explain the phenomenon. They are essentially building the explanation to the phenomenon one piece at a time. By the end of the unit, students should have an outline for their "Aha! Thesis" if they completed the light bulb page throughout the unit. Step 5: At the end of the unit, students write their "Aha! Thesis". The "Aha! Thesis" is a argumentative writing piece providing an explanation of the phenomenon and an answer to the “Big Question” we decided on at the beginning of the unit. The "Aha! Thesis" must be supported by information the student learned throughout the unit. It could be supported by core ideas, lab results, or other observations. See Figure 2 for the "Aha! Thesis Guidelines" I give my students. Given that the "Aha! 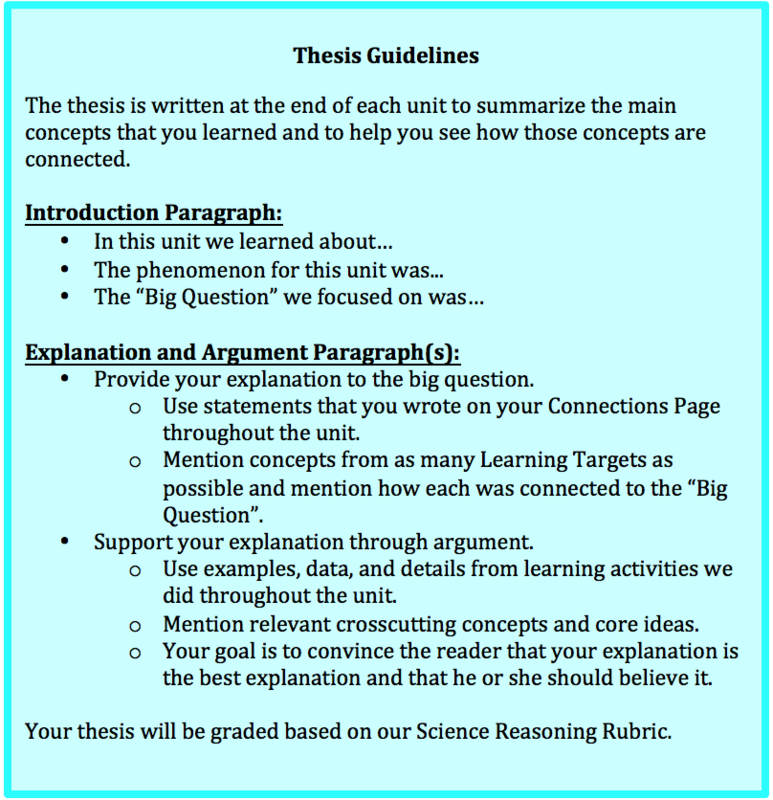 Thesis" is an argumentative writing assignment, it is graded according my Science Reasoning Rubric I shared in a previous post. The "Aha! Thesis" is due the day of the final assessment for the unit. I find that this provides a good way to help students study for the assessment, synthesize many of the important ideas of the unit, and to make connections between learning targets. Learning Target 1-1: I can use particle diagrams as a way to model the structure of matter. Learning Target 1-2: I can apply the Law of Conservation of Mass to explain situations involving chemical and physical change. Learning Target 1-3: I can define mass, volume, and density in terms of a substance’s particles. Learning Target 1-4: I can convert one unit of measure into an equal quantity of another unit. A burning candle placed on a balance. Students observed the mass of the candle appeared to decrease as the candle burned. Students observe that cobalt chloride paper turns from blue to pink, indicating the presence of water. The “Big Question” we settled on in class was something like: Why did the candle lose mass as it burned and where did the lost mass go? The “Big question” was a little different in each class since these are student-generated questions. Connections I Hope Students Make to the "Aha! Phenomenon"
Learning Target 1-1: Students learn that compounds are made of two or more different types of atoms connected together and that they can be broken down into smaller pieces. Students observed smoke, have evidence that water is produced, and with prior knowledge some students may know that CO2is produced as things burn. Students hypothesize that perhaps the candle wax is a compound and it was broken down into smaller pieces as it burned. 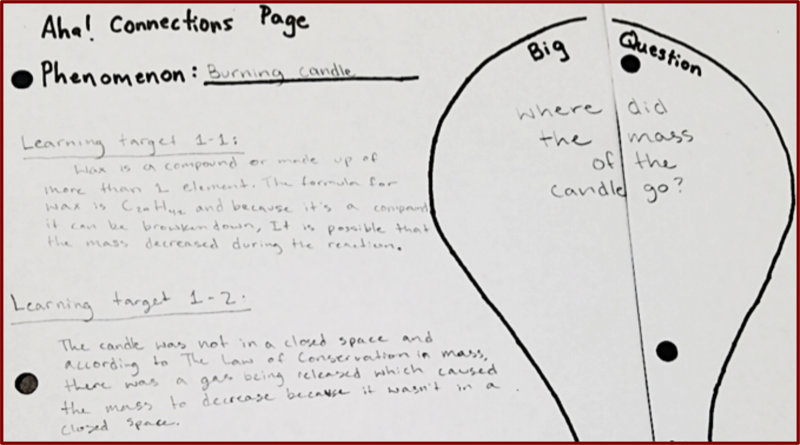 Learning Target 1-2: At first glance, it appears the burning candle broke the Law of Conservation of Mass since the balance showed a decreasing mass as the candle burned. However, students learned that the burning candle was not in a closed container and mass wasn’t really lost, it just escaped into the surroundings and the surroundings gained a little mass in the process. Learning Target 1-3: Students observed smoke rise up into the room from the candle. They realize that the “lost” mass of candle rose up into the room because the hot gases from the burning candle must have been less dense than the surrounding air. We cover buoyancy in my honors classes, so those students should be able to add that the hot gasses coming off the candle displaced an amount of air in the room that weighed more than hot gasses themselves, resulting in a buoyant force pushing the hot gas molecules coming from the candle up into the room. Learning Target 1-4: No direct relationship to the "Aha! Phenomenon" and that’s okay. Note: Later in the year after students learn about the mole concept, you may revisit this phenomenon and then use dimensional analysis convert from grams of candle wax gained by the surroundings to the number of wax molecule gained by the surroundings as the candle burned. Other phenomena I have successfully used as the "Aha! Phenomenon" for other units are: balloon in a flask, boiling cold water, and demonstrating a water bottle labeled with the number of hydrogen and oxygen atoms inside. You might want to pick up your own copy of Kellie Marcarelli's book, Teaching Science with Interactive Notebooks. 1 - Kellie Marcarelli, Teaching Science with Interactive Notebooks, Sage Publishing, 2010. Asking questions and defining problems in grades 9–12 builds from grades K–8 experiences and progresses to formulating, refining, and evaluating empirically testable questions and design problems using models and simulations. questions that challenge the premise(s) of an argument, the interpretation of a data set, or the suitability of a design. Scientific questions arise in a variety of ways. They can be driven by curiosity about the world (e.g., Why is the sky blue?). They can be inspired by a model’s or theory’s predictions or by attempts to extend or refine a model or theory (e.g., How does the particle model of matter explain the incompressibility of liquids?). Or they can result from the need to provide better solutions to a problem. For example, the question of why it is impossible to siphon water above a height of 32 feet led Evangelista Torricelli (17th-century inventor of the barometer) to his discoveries about the atmosphere and the identification of a vacuum. Questions are also important in engineering. Engineers must be able to ask probing questions in order to define an engineering problem. For example, they may ask: What is the need or desire that underlies the problem? What are the criteria (specifications) for a successful solution? What are the constraints? Other questions arise when generating possible solutions: Will this solution meet the design criteria? Can two or more ideas be combined to produce a better solution? Constructing explanations and designing solutions in 9–12 builds on K–8 experiences and progresses to explanations and designs that are supported by multiple and independent student-generated sources of evidence consistent with scientific ideas, principles, and theories. Construct and revise an explanation based on valid and reliable evidence obtained from a variety of sources (including students’ own investigations, models, theories, simulations, peer review) and the assumption that theories and laws that describe the natural world operate today as they did in the past and will continue to do so in the future. Engaging in argument from evidence in 9–12 builds on K–8 experiences and progresses to using appropriate and sufficient evidence and scientific reasoning to defend and critique claims and explanations about natural and designed worlds. Arguments may also come from current scientific or historical episodes in science. Evaluate the claims, evidence, and reasoning behind currently accepted explanations or solutions to determine the merits of arguments.